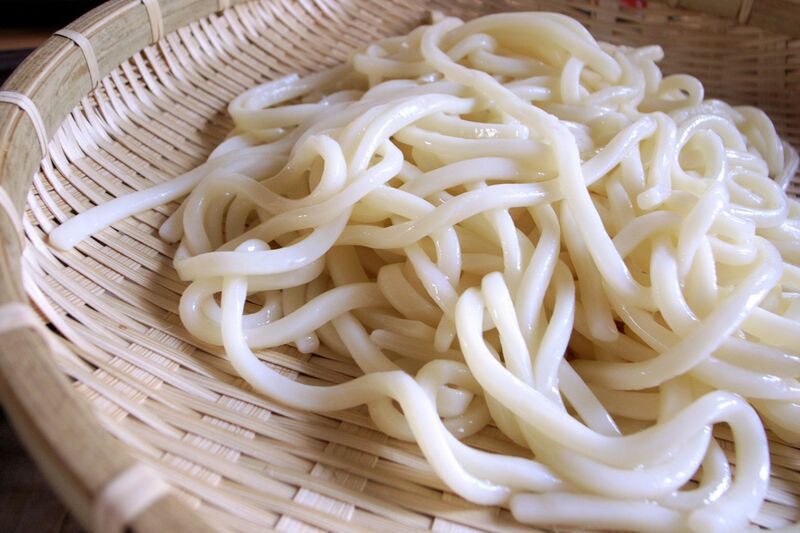 Udon are thick Japanese noodles made of wheat flour. They are thicker than soba noodles, white and chewier. Udon is widely available at restaurants across Japan and prepared in various hot and cold dishes. Below is a list of udon dishes that tourists will commonly find at restaurants across Japan. Note that there are some regional differences in terms of naming and seasoning. Zaru Udon noodles are chilled and served on a bamboo mat. They are accompanied by a dipping sauce and are dipped into the dipping sauce before eating. 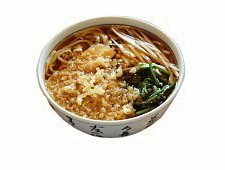 It is very similar to Zaru Soba, with the only difference just being the type of noodles. Kake Udon is a basic udon dish, served in a hot broth that covers the noodles. It has no toppings and is usually garnished with only green onions. Kake Udon is also known as Su Udon in the Osaka region. 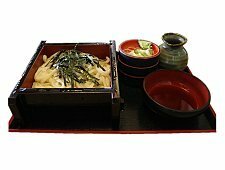 Kamaage Udon noodles are served in hot water, accompanied by a variety of seasonings and a dipping sauce. Some places have individual servings of Kamaage Udon in small wooden bowls while others serve family sized portions of Kamaage Udon in large shared wooden noodle tubs. 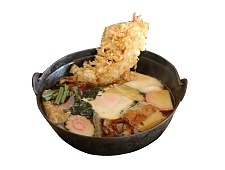 Tanuki Udon is served in a hot broth topped with leftover deep fried tempura batter (tenkasu). 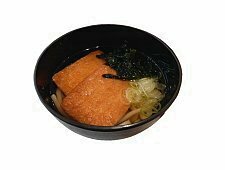 Tanuki Udon is not usually served in Osaka as tenkasu is often available for free at udon restaurants there. 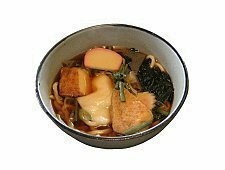 Kitsune Udon is served in a hot broth with aburaage, thin sheets of fried tofu, placed on top of the udon noodles. 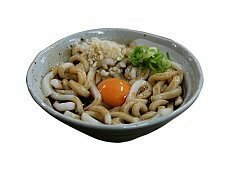 Tsukimi Udon ("Moon Viewing Udon"), like its soba counterpart, features a raw egg on top of the udon noodles, which is meant to resemble the moon. Tempura Udon is usually served in a hot broth with the tempura pieces placed on top of the noodles. Sometimes, the tempura is placed on a separate dish beside the bowl or tray of noodles. Tempura ingredients vary between seasons and shops. 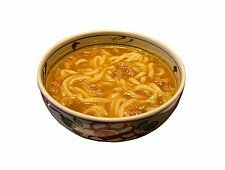 Curry Udon is udon noodles served in a bowl of Japanese curry. It is a popular dish to eat in winter as it is very warming. Because eating curry udon can a messy, some restaurants offer disposable bibs. 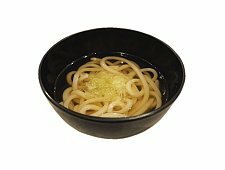 When they are not offered, please take care when eating curry udon as the udon noodles are prone to splash curry on nearby clothes. Chikara Udon is udon noodles served with the addition of a rice cake (mochi) in the hot broth. The Japanese word "chikara", meaning strength, is used as it is thought that the addition of mochi to the dish gives strength to the person eating it. 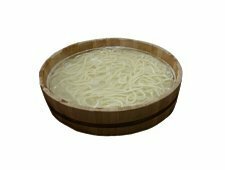 Nabeyaki Udon is a dish that is cooked and served in a hot pot (nabe). 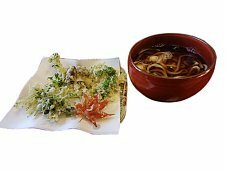 The udon noodles are cooked directly in the nabe together with the broth and vegetables. Tempura is a common addition before serving, but the more typical ingredients include mushrooms, egg, kamaboko (a pink and white steamed fish cake) and various vegetables. Many shops will serve this dish only during the colder months of the year.